Lily, Kate & Aine are sisters who who travel - or have travelled a lot. Their mom helps with the blog. Yam Haus – Boy Band – No Apologies! For spring break Aine and I went to Winnipeg to see Kate (at U of Manitoba) and Lily (at U of Winnipeg). The best thing about the visit was to see how nice the girls are to each other – when they’re not fighting about who is wearing whose clothes. And frankly if there were no fighting, I’d be worried. Lilly invited us to stay at her place. So that was nice. Kate invited Aine to her dorm’s talent show on our last night. So that was nice. Few high school freshman are invited to the college freshman’s dorm for anything. Everyone posed for me under the lights of the Winnipeg Art Gallery, which is my favorite thing to do in Winnipeg – so that was nice too! We had lots of good food. We met Lily’s boyfriend Sean – who is very easy to fit into the dinner table. Gotta like that in a guy. And he has awesome taste in music (and girls). Lily and I walked around her new, pretty upscale, neighborhood for a couple hours one day. We didn’t see as many murals as we saw in the old neighborhood but we didn’t hear as much yelling either. We went to see some bands and maybe the worst comic ever at a coffee shop one night. That was fun. Again, few high school freshman get to hang with the big dogs until 11pm seeing bands. And we even went for crepes afterward. Few people older than 14 want crepes after 10pm but we managed it. We all spent the day today at the Forks – a market of sorts by the River. It’s nice walk around that area – there’s a great view of the Human Rights Museum, St Boniface and the whole downtown. We had different kinds of food and mostly just hung out. Tomorrow Aine and I will leave at the crack of down – two hours after Lily has started working her shift at the airport. And we’ll look forward to having them home with us for Easter! Today I attended Homeless Day on the Hill. Mostly I attended the press conference because the Committee Session was full, the overflow room was full and even the halls were filled with people watching the session of the Health and Human Services Finance Division. They were talking about HF1043, increasing shelter, services and housing. The issue is that people can’t live with the MFIP subsidies provided. MFIP subsidy is unemployment insurance for jobs that don’t provide it; its income for children and hasn’t increased since 1986 – $437/month for a parent and child. We heard from one woman (video below) who lives in Duluth on $532 in support a month; she has two children. Her story was that one morning, about a year ago, she woke up with seizures. Now work is an issue. We heard from several people today. The Street Voices for Change folks had a lot of experience understanding how and why people needed help. The Ramsey County Sheriff’s Office had stories of what happened when everyone worked together as happened in St Paul during some of our coldest days. BUT the video I’ll start with is my friend, homeless advocate, Monica Nilsson. She was interviewed (unprepared, except she’s always prepared) by the media on general questions about homelessness – such as how does homelessness happen and what policies could help. Very simply, homelessness happens because housing costs more than many people can afford, especially when you factor in the need for first and sometimes last month deposit. There isn’t enough affordable housing to go around – especially for families. Homelessness has increased 40 percent in the last 4 years. And it’s not just an urban issue. It may seem like that, especially after last summer and the homeless encampments in St Paul and Minneapolis but one-third of homeless Minnesotans are in Cities, one-third in suburbs and one-third in rural areas. Normally I’d just post this on Facebook – but Facebook is broken today. (Which means no livestreaming of meetings, which means loss of remote civic engagement – but that’s another post!) I don’t want to lose the thoughts. And on a personal note, it’s fun when you see your friend be so good at her job. Last night I joined about 50 other volunteers to survey people experiencing homeless for the Point in Time count for Hennepin County. I ask a bunch of questions; the answer-er gets $5. It’s less money than for the Wilder Survey, which is done every three years, but there are fewer and easier questions. Volunteers attended a quick training where I learned that this is HUD-mandated reporting. I think the reporting is important – that which gets measured, gets done. But I’m not sure why volunteers are needed if HUD mandates it. At least three quarters of the people in the room were in the industry. They were outreach workers, shelter workers or maybe the brand new Commissioners (such as Human Services Commissioner Tony Lourey, Jennifer Ho, head Minnesota Housing Finance Agency and a few folks from Met Council). Kudos and thanks to all of them for being there – but imagine if people got paid to administer the surveys. Imagine if people got paid a living wage to do much of the work that many of us do as volunteers. Don’t get me wrong, I find the work interesting. I don’t mind doing it. But maybe if HUD is going to mandate the reporting, maybe they need to pay for it. And maybe that would help end homelessness for some people. Back to the surveys … I pulled the cushy job interviewing folks at the train station at the Mall of America. It’s warm there, it’s well lit and there’s a bathroom. Others talked to people on the trains and in outside places. I spoke to a half a dozen people or so. I spoke to one guy in his 30s. He had a Master’s degree. He had been in the Twin Cities just a few months and had a criminal record. I spoke to a girl in her 20s who admitted that maybe she had some issues with drugs or alcohol – but she’s “working on that.” A few folks had been homeless for moths or a year. One was going to sleep outside. (It was 20 degrees and falling.) Most would hang around the trains until the coffee shops opened. Everyone I spoke to was under 50 years of age. Everyone was pleasant, happy to talk and even happier for an opportunity to make a quick $5. A few wanted to know where to get more help. I had a brochure to share. Most had written off shelters because they seem full before they are even open. We learned that there are 1025 adults, 400-500 families and 75 youth sheltered in Hennepin County – and those beds are full. My experience is only my experience and I think it you talk to one person experiencing homelessness, you know what it’s like for one person. Everyone’s story is different. But if you want to hear a lot of stories, you listen to my friend Monica, who spoke at the Legislature at 8 am yesterday and then spent her whole night (until 4am or later I’m sure!) doing surveys last night. If there are 8 million stories, she has heard 7 million of them! 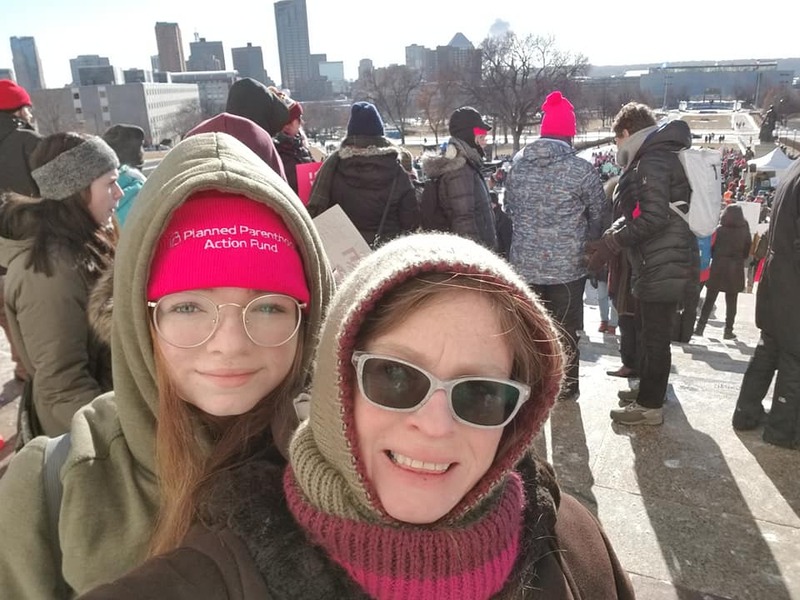 It was minus two degrees when we first got to the Women’s March MN 2019. So cold! But it was sunny and beautiful. It was a day to inspire people to get involved. It was a day of rewards for folks who are involved. Hopefully it energized us all. And it gave us all bragging rights for beating the cold – although I suspect the marchers in Bemidji and Barnum may have been colder. It was a smaller group than in 2017. Estimates that year were nearly 100,000; I just read police estimate this year was 4,000. But I don’t think attendance reflects a diminishing interest or passion – just weather. It was 35 degrees warmer in 2017! In fact, I have seen attendance at monthly civic engagement events grow in the year since I have become involved with the Women’s March. We are buoyed by the midterm election and we are ready to keep engaging until we bring change. I was livestreaming for the March and Aine was doing SnapChat. Because I was livestreaming, I didn’t get to take notes or even Tweet notes as I like to do – but I do have the full video to share. And it gave us the opportunity to talk to a few people about why they were there. A lot of women are there to represent the people who can’t be there, people who can’t speak for themselves, for their kids and the future generations. It’s generous and it’s good use of privileges that many of us enjoy but I think we need to be there for ourselves too. Making things better for ourselves is a good lesson for future generations and helps create a space and a history of space. For the (upcoming) Women’s March MN music podcast, I got to talk to Tina Schielske about her latest band Genital Panic. We spoke a little bit about having a platform at an age when you have someone to say. Marching for that platform at all ages for ourselves and others is a good reason to march. Not that youth don’t have messages too. They do! The impact of the Parkland shooting and of the strength of the students of Parkland was clear from all of the young speakers. They are on the frontlines of many issues, especially gun reform. They are still in schools learning how to deal with shooters. Would you keep a job where that was part of the orientation? The speakers here noted that seeing students from Parkland, seeing someone who looked like them (young) – encouraged them to get involved. We heard from a wide range of amazing women: an attorney who survived an 18-hour standoff at the border to get 20 asylum seekers across the border (including a 17 year old girl traveling alone who is still being detained! ), a young activist who lost a leg due in part to poor healthcare coverage who recognized that you can’t always help what happens but you can help what you do with it so she’s giving her voice to better access to healthcare, a native elder who has lost sister and a daughter who is active in the Missing and Murdered Indigenous Women, leaders from the Jewish and Muslim Women’s Coalition, Rep Ilhan Omar about her experience going from refugee camps to US congress and a young woman leading the charge for change in her school who is energized to see Omar, a woman who looks like her in Congress. Lots of talk of change, and leadership coming from us, intersectionality – we all do better when we all do better and we all need to accept a hand up and extend a hand up. One line I loved, a quote from Shirley Chisholm – If they don’t give you a seat at the table, bring a folding chair. We need to bring two, one for us and one for another new voice. Tokenism is out – we’re louder together. This is always a very sad, yet very beautiful event. A march and service for the members of the homeless community who have passed away in the last year. That includes people experiencing homelessness and advocates. Many friends will remember Nick Coleman’s passing this year. Each person is remembered on the march with a sign carried by a walker and in the service, when the call the name and light a candle for the deceased. Monica Nilsson carried the sign for Nick, which was very fitting. I think between his powerful pen, and Monica’s inside knowledge they have been able to shine a light on individuals and the community who needed help. This year the priest talked about a larger light shone on homelessness in the last year. It started with the Superbowl in Minneapolis in January. While a fun event for most people, the game, the hoopla and activities such as shutting down public transport made life tougher for people experiencing homelessness and there were demonstrations. Fast forward to summer, fall and into winter and the Twin Cities housed two large homeless encampments in St Paul and in Minneapolis. Both have received a lot of media attention. Both have been shut down, leaving most of the residents to find another place to stay in a town that simply does now have enough affordable housing or adequate shelter to accommodate the need. A little like the #MeToo movement – it’s a slow work in process. I don’t see a lot of change yet but at least I see a greater recognition for the need to change and do better. I think that’s why I find this service so heartwarming, it’s hosted and attended by people on the front lines – people who are always remembering and doing better. Today the St Paul Police evicted the campers down at the St Paul Encampment. The video below captures moments from a 90 minute visit. I am with homeless advocate Monica Nilsson through most of the video so she is the one you hear talking. The police came to move people on to new locations. New beds opened up today – 14 beds. There were about 40 people at the camp. The people in the camp are not the only people in the city experiencing homelessness. There will be a lot competition for those beds. So on a practical basis, the police were there to take people to other outdoor locations including the encampment in Minneapolis. (The Minneapolis encampment is better setup with porta-potties, running water and now heated tents.) Or maybe they will end up on the train or a bus all night. A few may get lucky and find a bed. It’s a big people shuffle. People pack up their stuff – but not all of it. Some of it isn’t worth taking. Some of it is too hard to carry. It’s difficult to watch people who have so little leave so much behind. Thankfully it wasn’t too cold but it’s November in Minnesota so it wasn’t warm either. It was much colder two days ago when campers got the eviction notices. Like the end of a super sad parade, staff (from the Department of Transportation) were there to clean up the mess. And doing the encampment version of vacuuming under the feet/tents of slow moving campers. It’s a crazy situation. When I arrived I saw police on horseback – luckily that was the only time I saw them. Sheesh. There were about a dozen police officers and various other paid city/county/state staff. I heard someone from the City say they have spent hundreds of hours working on the situation. So much money spent planning, talking, dealing with the homeless and this is what they come up with? Seems like there might be a better use of those resources. This isn’t the first time the camp has been evicted. I’ve seen people setting up their tents the by 3pm after a morning clear out. But this seemed different and they put up No Trespassing signs. There are a few places online where you can learn more and/or sign up to help. Advocates for the People of St Paul’s Cathedral Hill Encampment, Walking with a Purpose and Franklin Hiawatha Encampment. 50 Winter Safe Space beds opened Nov 1, operating from 10pm-9am, 14 will be added Thursday, 5 will be for street outreach referrals, the rest for law enforcement referrals. The video is rough but you can get the gist below. The encampment in St Paul is just west of 35E as it passes United Hospital, in the shadow of the St Paul Cathedral. There’s a strip of land behind the Summit mansions that includes a sidewalk and wooded areas. Many workout nuts know the steep staircase that runs from the James J Hill House to the encampment. It’s not a well-traveled area, except during Crashed Ice. According to the eviction notice, the police can drive people to a shelter on Thursday, but most shelters are not open at 10 am. My expectation is that on Thursday people will be moved but will return later that day, as I have seen happen in the past. Because there is no space at the inn! There is nowhere to go. We spoke to one gentleman staying in a tent, wearing a short sleeved shirt as I stood shivering in two jackets. His question – where would be a better place for people to go? The St Paul camp is contained with a fence and highway on one side, and a fence and hill on the other. He suggested the City charge dollar a day to cover the cost of clean-up and a port-a-potty. He insisted he was OK here. Although he wouldn’t say no to a zero degree sleeping bag. He had a tent that was insulated at least from the ground and a heater he turned on sparingly. Shelter isn’t even on his shortlist. He knows the cards he has been dealt and he is doing the best he can. He thought maybe the Department of Transportation owned the land and therefore might be out of jurisdiction of the St Paul Police. In fact it sounded like he might be looking at up today to see what to do about that. A group of people experienced in street outreach, including my friend Monica Nilsson, discussed the options for people, trains or outside in another St Paul neighborhood. Lots of people are living at the encampment. I see ingenuity, compassion and community at the encampments. I see good choices, bad choices, no choices. In 1991, Wilder estimate that there were 3,500 homeless people; in 2015 that number was 15,109, which was actually down slightly since the last count in 2012. I know about the Wilder estimates because I have been one of the counters. I volunteered in 2012 and 2015 to interview people who were homeless for their “single night out” report that happens every three years. I have always done a late night shift, interviewing people from 10 pm to 1 am at the bus terminal at the Mall of America. The police at the MOA told me that the numbers of people they see has never been higher. I’m not looking forward to seeing the numbers. I wish we could focus more ingenuity, compassion and community from the outside encampment to create better solutions for people staying there. We have been dealt better cards, we should be able to do better by our neighbors.